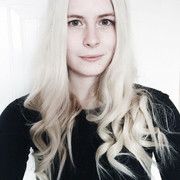 Today I'm bringing you my first giveaway in ages! 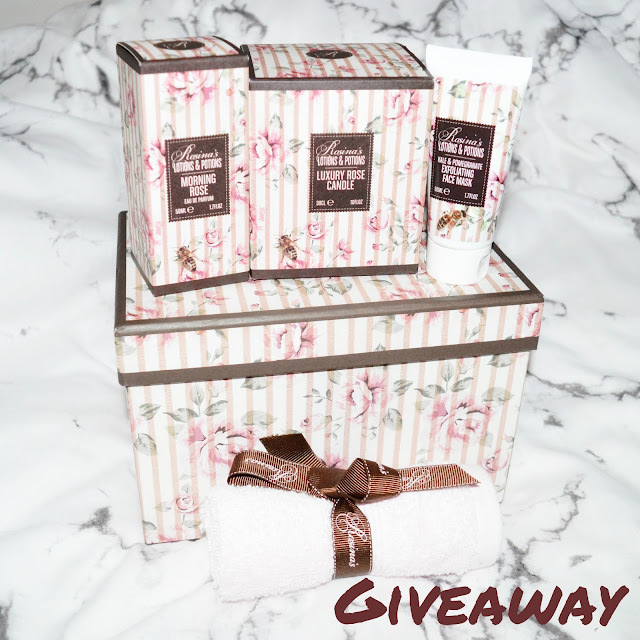 I'll be giving away this gorgeous gift box from Rosina's Lotions & Potions, so read on below to find out how you can be in the running to win. I have a box of these products myself and as soon as I opened the packaging I got the most beautiful scent from it. The products inside are lovely as well as the pretty packaging so this would make the perfect gift for a loved one or even a little treat for yourself. The giveaways ends on 2/3/2018 and is open Worldwide. What a lovely prize! I'd like to try the face mask. As a fan of skin care products, I am most excited to try the Kale & Pomegranate Exfoliating Face Mask. Most looking forward to the Kale & Pomegranate Exfoliating Face Mask. That would be the coolest birthday gift id ever get, my birthday is ar the end of the month. I think the Morning Rose Eau De Parfum. Morning Rose Eau De Parfum! Morning Rose Eau De Parfum, I love rose parfumes! I really like the Kale & Pomegranate Exfoliating Face Mask. This would be a lovely Mother's Day treat! This is so nice. I think I would love the Kale & Pomegranate Exfoliating Face Mask. I'm looking forward to trying the Kale & Pomegranate Exfoliating Face Mask. I'm most excited to try the eau de perfum. Kale & Pomegranate Exfoliating Face Mask sounds interesting! The Kale & Pomegranate Exfoliating Face Mask sounds wonderful. It will be a wonderful gift for my wife, soon a women's day (March 8) in Russia and Belarus, Ukraine! i like very much morning rose eau de parfum! The packaging is beautiful! I'm looking most forward to the face mask. I would have to say the Kale & Pomegranate Exfoliating Face Mask. I like the Kale & Pomegranate Exfoliating Face Mask. The Luxury Rose Candle sounds fantastic is what my gf would like to try. That exfoliating facemask sounds amazing. I would love to give that a go. My favorite item is the Morning Rose Eau De Parfum. Beautiful gift set! The candle is probably my favorite part. The candle is my favorite. The face mask sounds the best! It's a gorgeous prize I love anything Rose scented so would love to try it all if I had to chose a try first probably it would be the Morning Rose Eau De Parfum. The face mask for getting rid of my wintery skin! The morning rose Eau De Parfum definitely, l adore Rose scent so this would be so lovely!. I can imagine it smells wonderful!. The Luxury Rose Candle :) Love scented candles and with the weather at the moment it makes it feel nice and cozy! The Luxury Rose Candle - I'm a sucker for a good candle! I'd like to try the face mask. The face mask is definitely worth trying. The Luxury Rose Candle for sure.